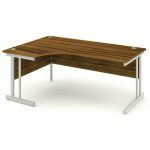 The Phoenix range off office furniture is our most competitively priced range of furniture but still offering excellent quality and styling and is as superior as our other office furniture ranges. The Phoenix range includes rectangular, wave and crescent office desks, mobile and desk high pedestals, storage including bookcases, cupboards and wooden filing cabinets. Rectangular desks offering various widths of 1200mm, 1400mm, 1600mm and 1800mm with a depth of 800mm and height 730mm. Available in 5 finishes including beech, maple, oak, walnut and white. 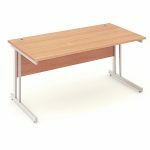 These desks have a 25mm thick desktop surface, dual cable management ports, adjustable feet for floor levelling and dual leg uprights for extra strength. Also available as a panel end version. Delivered flat packed, simple assembly is required. Wave desks offering widths of 1400mm and 1600mm with a depth of 1000mm/800mm and height 730mm. Available in 5 finishes including beech, maple, oak, walnut and white. These desks have a 25mm thick desktop surface, dual cable management ports, adjustable feet for floor levelling and dual leg uprights for extra strength. Also available as a panel end version. Delivered flat packed, simple assembly is required. Crescent desks offering widths of 1400mm and 1600mm. The depth of the desk is 800mm and 600mm at the return end. The width of the return is 1200mm and has a height of 730mm. Available in 5 finishes including beech, maple, oak, walnut and white. 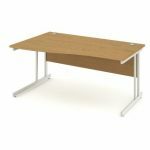 These desks have a 25mm thick desktop surface, three cable management ports, adjustable feet for floor levelling and dual leg uprights for extra strength. Also available as a panel end version. Delivered flat packed, simple assembly is required. 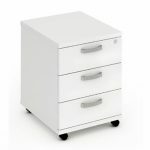 Mobile pedestals available as a 2 or 3 drawer version. 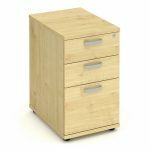 The 2 drawer pedestal has a single box drawer and a single filing drawer suitable for storing foolscap files. The 3 drawer pedestal has 3 box drawers. Both the 2 and 3 drawer pedestals are lockable and supplied with 2 keys and delivered fully built. Available in 5 finishes including beech, maple, oak, walnut and white. Desk high pedestals are designed to be positioned at the end of a desk. There are 2 depths of pedestal available, 600mm and 800mm. The 600mm pedestal is designed to sit at the end of the return end of a crescent desk. The 800mm pedestal is the depth of a standard desk and can be situated are the other end of a crescent desk or to the end of a rectangular or wave desk. The desk high pedestal has 2 box drawers and a single filing drawer suitable for storing foolscap files. Lockable, supplied with 2 keys and delivered fully built. Available in 5 finishes including beech, maple, oak, walnut and white. 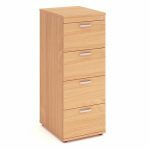 Filing cabinets available in 5 finishes including beech, maple, oak, walnut and white. The Phoenix filing cabinets are available as 2, 3 or 4 drawer versions. They include an anti-tilt mechinism which allows only one drawer to be open at any time preventing the cabinet from tipping over. Suitable for foolscap filing and delivered fully built. The Phoenix range of office furniture is available on a standard 3-5 day delivery or for an additional £10.00+vat per item can be delivered next working day. We also offer a full deliver and install service charged at £30.00+vat per item. This entry was posted in Office furniture, Office Storage and tagged desk pedestal, filing cabinet, office desk, office furniture, phoenix office furniture, wooden filing cabinet on August 2, 2017 by David Bradshaw.